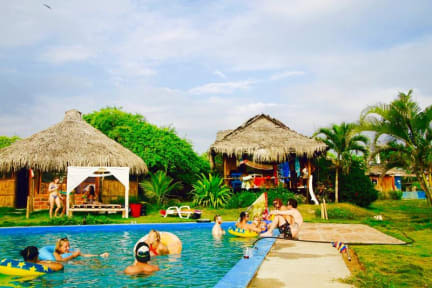 Kamala Surf & Backpacker Hostel i Montanita, Ecuador: Reservér nu! I had an amazing stay at Kamala hostel. The place just has such a great vibe and the staff, Anna, James, Kandi and their selection of exotic pets are only facilitating to that great atmosphere. The bar/hangout area is beautiful with an even more beautiful view over the ocean and the nearly 'private' beach down in front and here there are good opportunities to learn and practice surf. At night time there's a nice family style dinner with amazing food and later heaps of good tunes. Thx so much.